It is difficult to identify the extent to which the increase in travel in general and automobile trips in particular can be attributed to the way in which urban form has evolved within the Central Ontario Zone, given the complexity of the processes involved. As Figure 3.10 shows, all areas experienced considerable growth between 1996 and 2001 in households, population, employment, employed labour force (ELF), and trip-making. Very high growth rates occurred in Guelph/Wellington, Orangeville, and Barrie/Simcoe. Both downtown Toronto and the GTA outside the City of Toronto also exhibited above-average growth rates for population and households, and, in the non-Toronto GTA, employment as well. In absolute terms, as shown in Figure 3.11, most growth in the Central Ontario Zone during this period occurred in the GTA outside Toronto (61% of the population growth; 56% of the employment growth; 58% of growth in resident-generated travel); 76% of total population growth and 73% of total employment growth occurred outside the cities of Toronto and Hamilton - that is, about three-quarters of the growth in the generators of person travel (population and employment) occurred outside the two largest and most transit-oriented cities in the Central Ontario Zone. Given the dominance of the automobile outside these cities, it is not surprising that auto-based travel (and associated road congestion) has grown considerably in recent years. Appendix III contains information on the net effect of Central Ontario Zone population and employment growth and distribution on person travel origin-destination flows in the region. Just under 14 million trips occur within the Central Ontario Zone on a typical weekday, which represents a 16.6% increase relative to 1996. Of these trips, 75% have both their origin and destination within the GTA, and another 3% involve a GTA origin or destination. The City of Toronto is the destination for 37% of all trips in the Central Ontario Zone (5.2 million a day) while the remainder of the GTA is the destination for 39.5% of all trips (5.5 million a day). Of the remaining 22% of trips that lie wholly outside the GTA, about half have their origin and destination within the same region, and the other half involve a trip between two different regions. Guelph/Wellington, Orangeville, and Barrie/Simcoe all exhibited very high growth rates as both an origin and destination of trips. The non-Toronto GTA also had an above-average rate of growth on both an origin and destination basis and accounted for nearly half (49.5%) of the total growth in trips. Planning District 1 also experienced above-average growth for trips to and from most regions outside the City of Toronto. leapfrogging beyond the urban fringe to create pockets of development that are not directly connected to previously urbanized regions, leaving undeveloped portions of land separating these pockets from the urban boundary. Although some infilling has occurred in recent years, especially in the Toronto Central Area, most growth for some time has occurred in the latter two ways. In general, the impact on roadway congestion and environmental degradation is greater for urban boundary expansion than for infill and greater still for leapfrog development patterns, since the potential to serve the resulting travel patterns by transit (or by non-motorized modes) declines consistently and dramatically. Figures II.4, II.5, and II.6 in Appendix II illustrate this assertion. 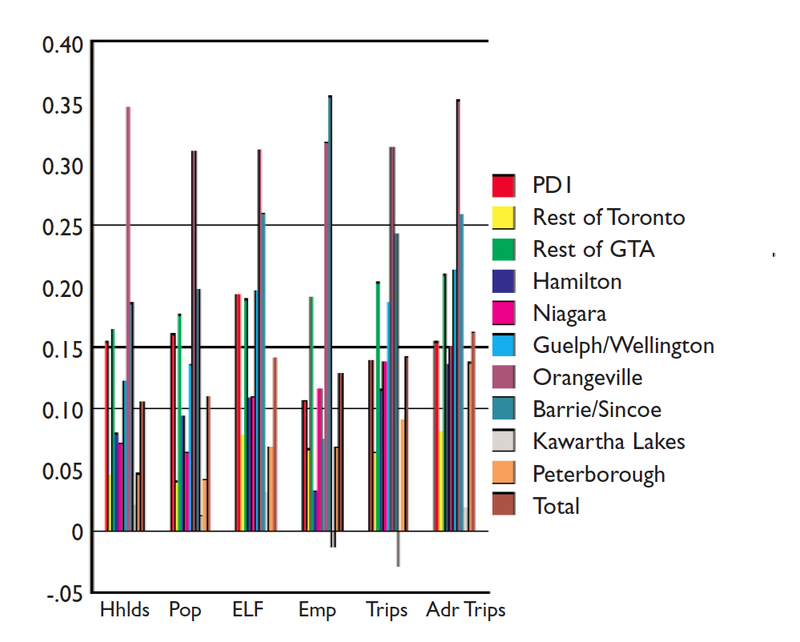 Figures II.4 and II.5 show 1996 daily mode shares for transit and GO Rail, respectively for the GTA+H by trip origin zone. Transit usage clearly declines dramatically as one moves away from central city locations and major rail corridors. Figure II.6 displays the estimated average CO2 emissions per household within the GTA+H in 1996 by the home traffic zone of trip-maker. That is, the CO2 generated by a given auto-drive trip is attributed to the driver's zone of residence, regardless of where the given trip occurs.17 The increase in CO2 emissions as one's residential location moves away from the urban centres is clearly evident in this map. In order to explore the relationship between travel demand and urban form in greater detail, Appendix IV presents an analysis of 1986 and 1996 TTS data for the GTA+H.18 In this analysis, "trip density" is used as a simple surrogate measure of level of urbanization, where a zone's trip density is simply the total number of trip ends (that is, trip origins plus trip destinations) observed to occur within the zone over a 24-hour weekday period, divided by the zone's gross area. As is discussed in detail in Miller et al. (1990a), trip density provides a useful single index of the level of urban activity, or urbanization, in a zone, since it integrates both population and employment effects. That is, as either population or employment (or both) increases in a zone, so does the trip density. In particular, the 1990 study identified six classes or levels of urbanization which correlate well with specific ranges in trip density. These classes are defined in Appendix IV. Note that, while this is called an "urbanization" categorization, it includes rural and small municipality classes and so is applicable to the entire range of land uses and development levels found in the Central Ontario Zone. Although considerable scatter exists in the data, transit usage clearly is positively correlated with urbanization level and trip density. Nearly 70% of population growth 1986-96 in the GTA+H occurred in rural or low density suburban locations, with over half of this (39% of total growth) occurring in formerly rural areas. 88.1% of the growth 1986-96 in auto-drive trip ends (trip origins or destinations) and 85.6% of the growth in total (all mode) trip ends occurred in rural and suburban locations. Transit trip ends actually declined slightly in the higher urban density classes. This likely reflects a combination of land use effects (the other ends of these trips are more suburbanized in 1996, resulting in less transit usage) and transit service cutbacks. Auto-drive trips and total trips increased at a greater rate than population in suburban zones. This may partially reflect employment-related trip generation effects in these areas, but it also is an indication that transit services in these zones tended to not keep pace with travel needs. Clearly the distributions of both population and employment within a region are critical to the determination of travel flows and mode shares. While the analysis to this point has tended to focus on the residential side of the equation, it may well be the case that the location and density of employment is more critical to the design and performance of the transportation system than is the distribution of population (important as population density is).19 There are at least three reasons for this. High employment density means that the non-home end of trips will generally be a short walk from a bus stop or a rail station, whereas lower densities inevitably mean longer (and often more unpleasant) walking distances. Higher densities allow for higher transit service frequencies and more extensive transit networks focused on the employment centre, thus improving the level and cost-effectiveness of transit service and its competitiveness relative to the auto. If the magnitude and density of employment is sufficiently high, then higher-order transit services such as light or heavy rail become viable propositions, thereby further enhancing the attractiveness of transit. To illustrate these observations, consider Figure 3.12, which displays the 1996 distribution of GTA employment by TTS traffic zone. As is clear from this map, the GTA is a multi-centred region with major areas of employment in Toronto, Mississauga, and Oshawa, southern York Region and, to a lessor extent, along the QEW corridor in Oakville and Burlington. In particular, the Toronto Central Area and the central-to-northeast Mississauga commercial areas (from Square One to Pearson Airport) represent the dominant two employment areas in the GTA and the Central Ontario Zone as a whole. This distribution of employment, combined with the corresponding distribution of the employed labour force, determines the morning and afternoon work trip commuting patterns for the GTA, along with much of the daily travel for shopping, personal business and other non-work/school activities. The ability to serve these employment-based trips by transit, however, depends not just on the magnitude of these trips, but upon their density. Figure 3.13 replots the 1996 employment data in terms of zonal employment density. 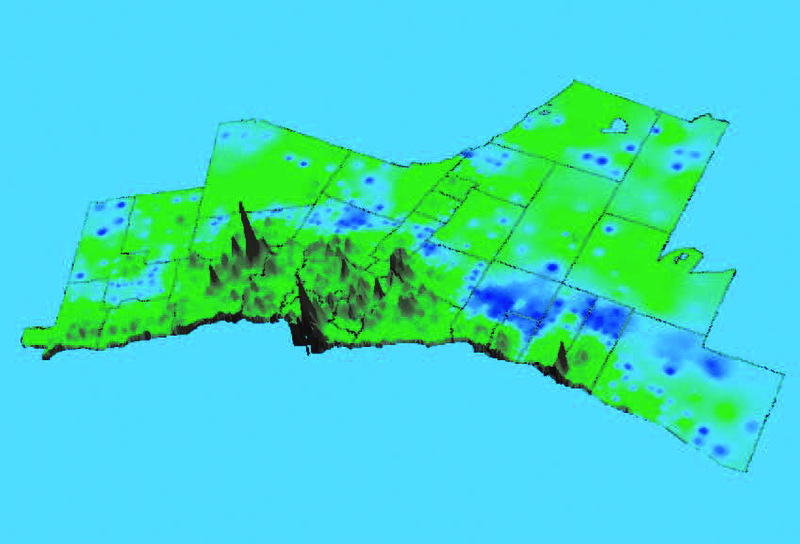 From the perspective of employment density, the GTA has a very different look: it appears to be almost totally monocentric, with a very high employment density in downtown Toronto and with virtually all the other employment centres identified in Figure 3.12 "washing out" into a near-uniform density distribution - although the difference between the more developed inner GTA areas of Toronto, Mississauga, southern York Region, and the lakeshore corridor through Oakville and Burlington is clearly distinguishable from the less developed regions further away from Lake Ontario. The ramifications of Figure 3.13 for travel patterns and transit usage are dramatic. Figures II.7 to II.9 in Appendix II display the spatial distribution of 1996 GTA trip origins for all daily trips destined to the Toronto downtown, Mississauga Square One and the Pearson Airport district, respectively.20 Downtown Toronto and Square One travel patterns are similar in that both show a high density of nearby trip origins and then a decreasing density of trip ends as the distance from the employment centre increases. The Toronto pattern, of course, extends over a much greater area (essentially the entire GTA) than does Square One's, reflecting the much larger employment base of downtown Toronto and its correspondingly greater catchment area. The Pearson Airport pattern of trip origins is similar to downtown Toronto's in the sense that it, too, represents an extensive catchment area. 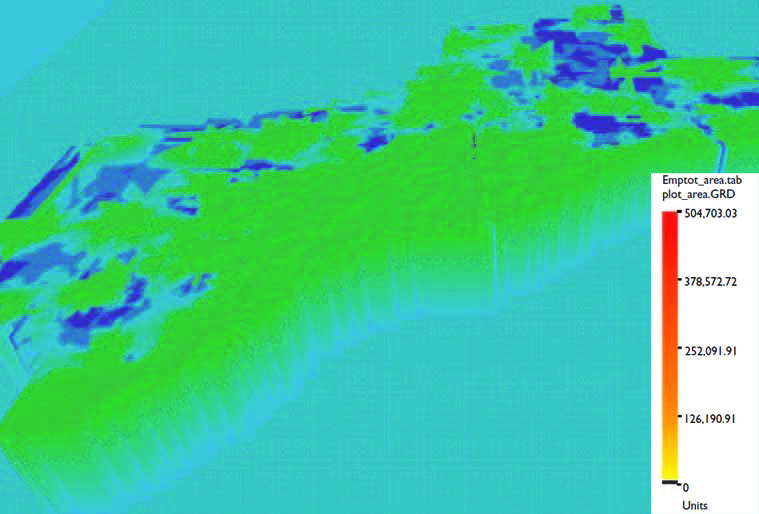 Otherwise, however, it is very different, showing a much more dispersed pattern, with no significant concentration of origins, either close to the airport or along major transportation corridors (the later being another feature of the downtown Toronto pattern). Table 3.1 shows the effect of the different employment densities and travel patterns on both morning peak-period and 24-hour transit use (including GO Rail) in 1996 for these three employment centres. Points to note from this table include the following. 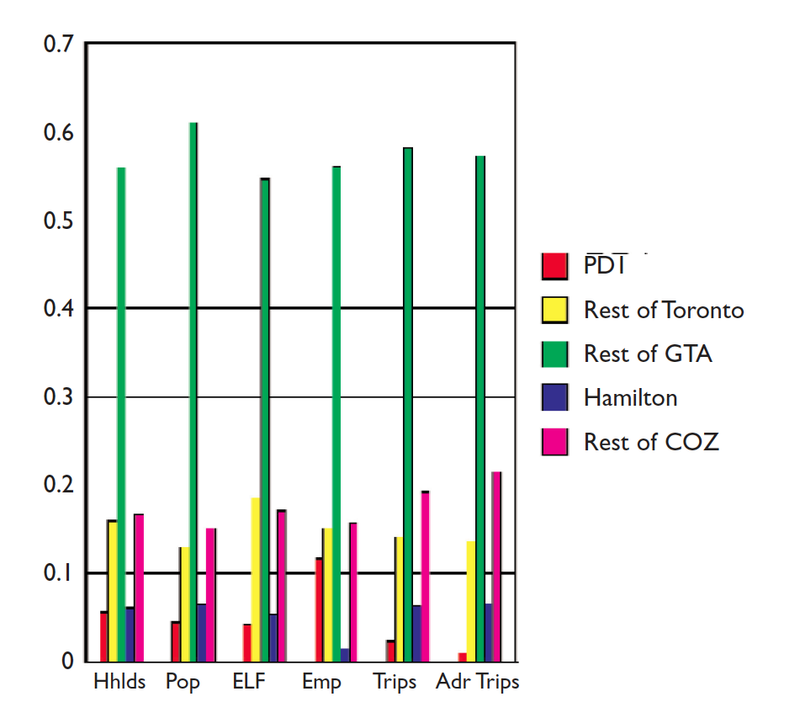 Also noteworthy is the uniform nature of transit mode shares for the Toronto Central Area: regardless of trip origin, about 38% of all daily trips to the Toronto downtown are by transit, while in the morning peak-period approximately 53% of all trips are by transit, again regardless of trip origin within the Central Ontario Zone. Transit usage for downtown Toronto destinations is not just a peak-period phenomenon, given that 38% of total daily trips to the downtown use some form of transit. Pearson Airport, with its low employment density, lack of any form of high-capacity transit service, and dispersed travel patterns naturally generates minimal transit usage. Square One is a focus of the Mississauga transit system, and so does achieve modest levels of transit usage (a 10% daily transit mode share is fairly high by North American standards for this sort of suburban or edge city type of centre). The low employment density of this centre, perhaps along with its lack of any form of higher-order transit (bus- or rail-based), however, mitigates against its achieving downtown Toronto-type levels of transit usage. Undoubtedly the lower population densities in its primary catchment area contributes to its lower transit mode shares, although the more distant downtown Toronto area achieves four or five times greater transit mode shares in this same catchment area than Square One. Square One achieves a higher daily transit mode share than in the morning peak-period. This is almost certainly due to returning residents in the evening peak-period (most likely from Toronto destinations), rather than a reflection of all-day Square One-based trip attractions. The impact of residential density and transit network density/service levels is also evident in that transit mode shares from the City of Toronto to Pearson Airport area are higher than from Peel Region, even though longer trip distances are usually involved, and the Toronto to Square One mode shares are comparable to the within-Peel mode shares (the 14.7% all-day Toronto-Square One mode share is artificially high because it captures Mississauga residents returning home from Toronto workplaces, and so reflects neither Square One as an employment centre nor Toronto as a residential area). 17. See Miller and Lee (2002) for further discussion of this analysis. 18. Given the very recent availability of the 2001 data, it was not possible to update this analysis to include 1996-2001 trends for the COZ as a whole. The conclusions drawn from this analysis of the GTA+H, however, generalize to the COZ as a whole. 19. Employment is both a direct generator of work-based trips and a surrogate for many non-home activities that generate non-work/school travel (shopping, recreation, personal business, etc.). 20. The Pearson Airport flows may include some GTA residents going to or from the airport as part of an air journey to or from another city. The trips captured in the survey, however, largely consist of "normal" weekday trips to work or for business purposes. 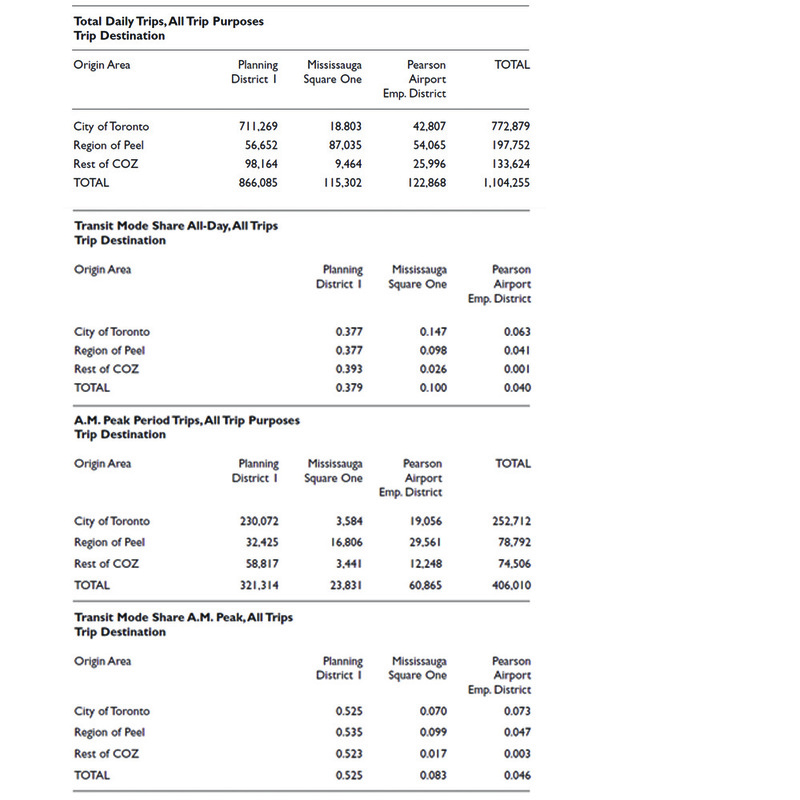 The data do not include airport-based travel by visitors to the GTA, since such trip-makers are not included in the survey sample. 21. Indeed, as has been previously noted, this performance is, in fact, supply-constrained, particularly in the case of GO Transit: if more commuter rail and transit service were provided into the Toronto Central Area, more people would use transit for certain trips.